Noha Mellor is Professor of Media at the University of Bedfordshire, United Kingdom, and Adjunct Professor Middle Eastern Studies at Stockholm University, Sweden. She’s authored or co-authored several books about Arab media, including The Making of Arab News (2005), Modern Arab Journalism(2007), Arab Journalists in Transnational Media (2011), Arab Media (2011) and Reporting the MENA region (2015). **This piece was first published on Jadaliyya.com on March 23, 2018 under the New Texts Out Now (NEWTON) series. Noha Mellor, Voice of the Muslim Brotherhood: Da’wa, Discourse, and Political Communication (London & NY: Routledge, 2017). Noha Mellor (NM): As a native Egyptian, I was immensely moved by the 2011 uprising and the temporary unity among all social groups in Tahrir Square in their call to topple the regime. However, like many Egyptians, I felt that the revolution was hijacked by the strange alliance between the Muslim Brotherhood (MB) and the Egyptian army. I was not the only one who felt curious to learn more about the MB then: in fact, books about the MB were among the bestsellers in Egypt following the 2011 revolution. Scholars like me were also curious about the MB as evident in the many theses, articles, and books about the MB that have been released since 2011. 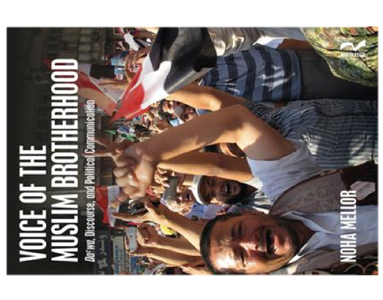 In this new book, I wanted to offer a fresh and close look into the communication strategy of the MB, focusing specifically on published periodicals, biographies, and websites that represent the voice of the Brotherhood, and I believe this book is the first book-length study about the MB media. I adopted an interdisciplinary approach, integrating Media Studies and Social Movement Theory to analyze the MB as an “interpretive community.” I looked into the core mission of the Brotherhood, namely its da’wa, which is the declared aim of the MB. NM: I discuss the MB as a social movement, with its complex organizational structure, its existence for ninety years, and its mission, albeit ambiguous, in transforming society. I argue that the MB’s rhetoric relies on emotionally charged morality politics; instead of facilitating an open debate about the implementation of new policies to improve social life, morality politics calls for an immediate righting of a wrong by demonstrating the moral position of speakers versus the allegedly irresponsible opposition. I argue that the success of the Brotherhood to reach out to large sectors of Egyptians was due to the ability of the organization to implement its ideas in practice. Thus, they did not just call for people to be more pious, they also built mosques; they did not only urge Egyptians to stop sending their sons and daughters to certain schools, they actually built schools to divert the flow of students to. The Brotherhood also managed to capitalize on emerging political opportunities throughout its history (save for the period between 1954 and 1970), including Sadat’s policies allowing the MB and other Islamist groups to operate freely to form an opposition block against the Nasserists and Socialists. The MB also received subsidies and other forms of support from internal and external allies, and this support constituted, in my view, a huge resource available for the Brotherhood, allowing it to spread its reach outside of Egypt. Also, the MB members and supporters seemingly subscribe to the same myth underpinning the movement, despite the sporadic conflicts and tensions within the group. This shared perception is what I call the unique brand of the Brotherhood movement, and it is this brand that helps position the Brotherhood vis-à-vis other groups and that facilitates the aggregation of the various interpretations of the movement’s history, mission, and progression. Thus, the political opportunities (including financial support) were also accompanied by discursive opportunities that facilitated the process of attracting new supporters around the “al-Banna brand.” The MB’s shared narrative revolved around one main conceptual schema, namely, the notion of the threat of “Western incursion,” which feeds into the idea that Islam is threatened by erosion in Muslim societies, in the name of modernization and progress. I have coined it a “conceptual schema” because it serves as a roadmap of various relationships among different actors and a meta-narrative with causal mechanisms of power and hegemony. Such a schema has become so naturalized in the Egyptian political discourse that it has been used by subsequent political regimes and mainstream media. My main argument in this book is that the Brotherhood media personalities speak with a rather intermittent voice, delivering an incoherent message whose tone is changeable and fluctuating and that cannot be claimed to truly represent the heterogeneity of the group. That voice is mostly the one of the old guard, which has kept the right to speak on behalf of the whole group as its entitlement; it is also a voice that can be mobilized for the few stars of the group, such as Khairat al-Shatir, who owned shares in several media outlets. I also show the contradictions within the MB: they rejected outsiders’ attempt to chronicle the movement, and yet they refused to publish their own “official” chronicle of their movement; they claimed that they want democracy, and yet they refused to apply basic democratic rules in promoting core members and rejected members’ call for the leaders to disclose the financial accounts; they claimed that they rejected violence, but a group of them endorsed violence against the security forces following the toppling of Morsi; finally, they refused the regimes’ requests to register the MB officially as a society, and yet they continued to operate as a de facto organization. NM: My previous books about Arab journalism did not sufficiently reflect on the issue of religion, particularly Islam, on media production, so this new book supplements past works in that it provide an extensive study of the media and communication strategies of the MB. This book is also relevant to my monograph The Egyptian Dream (2016), which discussed the meaning of national identity as perceived by Egyptians. For instance, whereas nationalist discourse is based on the love for the place, the land, or the territory, the Islamist discourse is based on affiliation with global Islamic communities, thereby stressing a de-territorialized identity. Some of the harshest misconducts committed by the MB, according to Egyptian mainstream media, were related to compromising this territorial nationalism, e.g., the jailed MB leaders were accused of planning to sell off the Suez Canal to Qatar and to hand over Sinai to Hamas as an alternative Palestinian homeland. NM: I hope scholars as well as journalists specializing in the Middle East will read this book, and I also hope MB members and supporters read it and engage in debates about the issues discussed in the book. J: What lessons did you personally learn from working on this book? NM: In the process of research for this book, I rediscovered my native Egypt. I read magazines, books and memoirs of people who lived during the 1930s and 1940s, and I learned a lot about the plurality in the Egyptian public sphere then: there is, for instance, evidence that the interwar period and the years following World War II witnessed a pluralistic, albeit competing political sphere. There were debates then that could never take place now in Egypt, such as faith debates between Christians and Muslims, or the call by well-known Muslim scholars to revisit the tradition of Hadith and the credibility of the content of some Hadith, which has now become a thorny issue leading to the recent arrest and imprisonment of some intellectuals in Egypt, such as Islam el-Behairy. Even the MB magazines from the 1940s demonstrated a more diverse debate among members, some of whom challenged Hasan al-Banna, the MB’s founder, to provide a written manifesto or books clarifying their specific project. As a result, al-Banna was forced to produce what he called a “cultural compendium” to his members, which included extracts from books by authors representing various disciplines. diverge from that specially cultivated generation. On the other hand, the movement did not even adopt one unified curriculum for its cultivation classes, which drew on different sources (writings of al-Banna, Qutb, Said Hawwa, and Ali Laban). The movement also propagated a simple slogan (“The Qur’an is our constitution and the Prophet is our leader”), while curtailing any serious debates about its concrete politico-Islamic manifesto, as illustrated in the lack of debate in their outlets (print and online) and the schism that has characterized the group indubitably since al-Banna’s death. It is difficult to concretize what the group stands for in terms of its Islamic project and how this is any different from those of rival groups such as the Salafists, especially when MB mid-ranking leaders were not always in agreement about certain religious rules – such as the stance towards Copts […]. This brand has been facilitated via selected discursive strategies aiming to contextualize the movement not only within the history of Egypt but even the whole region. It is this branding that made some dissenting members inclined to believe in the group’s “divine” character and its being a monument belonging to all Muslims. The movement began with a focus on morality politics based on the narrative of the “decline” of true Islam and a call to a “return” to authentic Islamic norms. This narrative was to color the movement’s discourse for decades, depicting it as the “redeemer” that would guide Egypt and the whole of the Islamic states towards the right path and thereby “awaken” those who had been led astray for decades and even centuries. In so doing, however, the movement ended up creating its own tyranny to replace what they coined as that of Western dominion by putting themselves forward as the only viable movement while belittling or directly attacking other Islamist activities. The movement also commanded its members to dissociate themselves from other groups in society and to refrain from reading material deemed by the MB as aiming to destroy Islamic ideas. In addition, the MB media discourses very much depended on blending texts and genres – that is, the Qur’an and Hadith – with narrative and opinion in order to bestow an aura of authenticity and power through invoking the authority of religion. Their online sites did not reflect the diversity of membership and views within the movement, their clerics and leaders did not seriously challenge the puritan Salafist discourse, and the leaders never allowed transparency, particularly with regard to their finances. The movement also resorted to the exercise of “re-writing history”, meaning that they deliberately revisited several historical episodes in order to highlight their version of it, particularly during the period of Nasser’s rule, with a heavy focus on the 1967 defeat as the defeat of “secularism”; in so doing, they completely ignored the subsequent 1973 war, whose significance had been exalted in mainstream media and educational curricula. […]. [T]he most significant success of the MB and other Islamist movements in Egypt (and the region) has been their persistence in exalting the Islamic discourse as hegemonic in the political and knowledge fields. Advocating the need to apply Sharia as the demand of the impoverished masses, the MB and other Islamists managed to impose their aims as legitimate political demands, prompting politicians to draw on the same Islamic discourse and coat their own policies with a religious flavor in order to appease the masses. While Egypt in the early twentieth century equated ignorance of modern (Western) sciences with real jahiliyya, a few decades later it exalted religious (Islamic) knowledge above Western science and technology, allowing the Islamic discourse to hegemonize social, cultural, educational, and, above all, political spheres. […] Thus, the Islamic discourse has dominated other fields, not just the spiritual one, and has become a form of strong symbolic power. […] When that religious discourse, albeit selective, has been utilized by those holding political power, it has created a significant discursive opportunity for Islamist movements. Such religious discourse has penetrated the national and social identity constructs that depend on the presence of an “other” for their significance, or the construction of the Egyptian as the antithesis to the American, British, Israeli, and so on. While Egyptian statesmen failed to unite the nation around one set of values, religious groups like the MB filled the gaps in the cultural sphere and civil society, although their efforts culminated, ironically, in enforcing the sociocultural status quo; this is one reason why their regime failed to restore order or strengthen the post-revolutionary state.